Changing Table Chats offers caregivers fun rhymes to share with their children while they are using changing tables in public bathrooms around Ithaca and Tompkins County. The chats are laminated and posted above public changing facilities to be read or sung while using the changing table or bathroom. A variety of chats are offered to businesses so a new option is available for rotation or encountered when using a different location. Encourage parent-child interactions during routine daily tasks. Involve community businesses and organizations in literacy efforts through easy to manage activities that enhance their facilities. Increase engagement during excursions and activities by promoting new ways of thinking about learning during daily tasks. Make it easier for parents to support their children’s learning and development by creating a language rich environment. Parents and caregivers change their children’s diapers thousands of times in the first few years of life, when the majority of cognitive growth and language development happens. Offering a simple and fun rhyme to sing to babies and toddlers during this time helps parents keep active children engaged and takes advantage of a natural opportunity for connection. 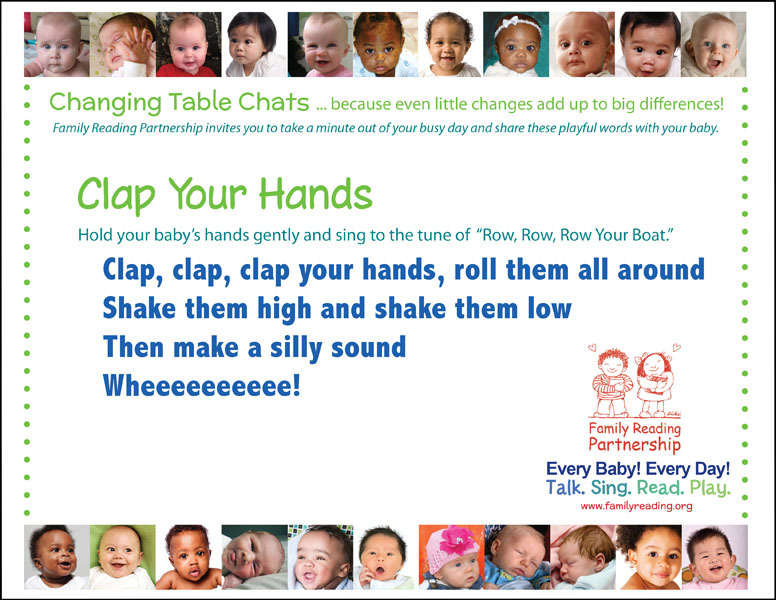 Changing Table Chats is part of Family Reading Partnership’s Every Baby Every Day initiative. This initiative funded through a grant from the Park Foundation, launched in January 2014, and is dedicated to all babies having a loving and language-rich environment. Language and literacy development begins even before birth, and is dependent upon hearing words through social interactions, like serve-and-return conversations, with the people in their lives. We want to ensure that every single baby born in Tompkins County, NY experiences talking, singing, reading, and playing every day, beginning at birth or even before. To do this we are launching exciting programs like Changing table Chats that re-envision every day activities as opportunities for adults and children to interact in simple, fun ways that support development and learning. Studies show songs, and rhymes are particularly motivating and effective ways to teach young children language. There are over 17 locations currently displaying the chats around Tompkins County.